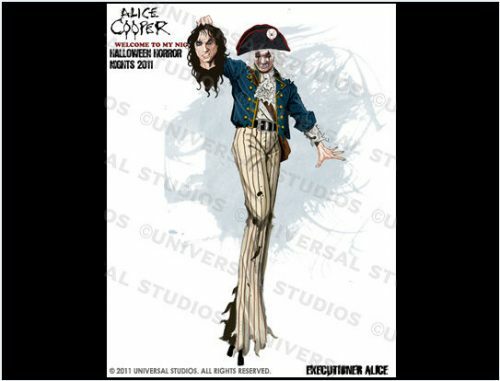 Starting September 23, 2011 and on select nights through October 31st, there will be a new “Halloween Horror Nights” maze at Universal Studios Hollywood where guests can go on a terrifying trip through legendary rock icon Alice Cooper‘s twisted mind, where his most famous songs, bizarre themes and demented characters collide inside a living horror movie. This new attraction is inspired by the rocker’s landmark concept album and its long-awaited sequel Welcome 2 My Nightmare which is due out on September 13 through Universal Music Enterprises. This one-of-a-kind walk through experience will include trademark elements from Cooper’s shows, such as guillotine decapitations, electric chairs, a sadistic insane asylum, predatory snake and giant Black Widow spiders that have helped make his imagery timeless and indelible.